Paddleboarding has quickly become a very popular outdoor activity for both adults and kids. Being able to exercise while enjoying Mother Nature and spending time with your family has never been more fun. However, there’s no reason to leave your four-legged family member at home when you pack up the SUP boards and paddles and head off to the river, lake, or even beach. Paddleboarding with your dog allows your pet to spend time with the rest of the family even when you plan for a long day out at the water. If you plan on bringing your SUP boards to the lake while you are camping, you don’t have to worry about having someone stay behind to watch Fido or having him in a vehicle, which can be very dangerous, especially in the Summer months. Make the motions of paddling and reassure them that the paddle moving around them is safe. Once your dog has been well trained and is comfortable with the sport, he or she won’t want to get off the water. That training needs to start early so that everyone, including your pet, stays safe. Safety should always be at the front of your mind when participating in any sporting activity and there are some ways in which you can ensure your dog is safe and that having them on the paddleboard doesn’t risk anyone else’s safety. Let’s look at the steps you should take to get them comfortable with the board and the movements when you’ve decided to bring a dog with you on a SUP board. Step 1: Place your paddleboard, along with the paddle, in an open area of your home where your dog is likely to see it and get curious. Let them sniff and smell it for as long as it takes for them to see it as normal. This could take a few days. Step 2: They may have already walked on it, or even laid on it, while they were checking it out. However, you want them to associate the board with something positive. Set a treat on the board in a spot where they will have to get onto it to reach it. Step 3: Once they have seen the board and know that it is nothing dangerous, it’s time to get them comfortable with their PFD. Make sure it is fit properly for their body and let them wear it around the house. Once they feel comfortable walking around, repeat Step 2 while they are wearing it. Step 4: It’s important that your dog understand when you want them to step onto the paddleboard and when you want them to step off of it. By using commands that will be easy for them to learn and easy for you to remember, they will learn quickly. If you use words that are not the simple “on” and “off,” they won’t be as confused if they hear these words used in random conversation while you and your family are on the water. Using hand motions, and some helpful guidance the first few times, offer a treat once they get onto the board after hearing the keyword. Make them stay on the paddleboard until you say the keyword to signal them to step off of it. If they do it correctly, offer a treat. This step should be mastered before continuing. Step 5: Once they are comfortable sitting on the board for extended periods of time and don’t walk off without you saying the keyword, sit or stand on the board behind them so they get the feeling of sharing the space on the board with you. Step 6: When standing on the board behind your dog, start adding a gentle rocking motion while encouraging them to stay put both with the command you have chosen and taught them and with reassuring pets. Most 4-legged animals get very nervous on unsteady surfaces and this will be no different. By letting them know this this is safe and you are in control of the rocking, they will trust the rocking motion as normal when around the paddleboard. This is important because as you move from side to side to paddle the board through the water, it will rock gently and the dog should expect it before even coming near the water with the board. Step 7: Pick up the paddle and stand on the board behind your dog. Make the motions of paddling and reassure them that the paddle moving around them is safe. Not only is this important for them to get used to, but you need to be able to get used to lifting the paddle over them when you bring it around the front to switch sides. This will be good practice before you get the paddleboard and your dog into the water. Step 8: Bring your gear and your dog to a calm paddling area. Run through all of the steps above, still using treats, on a dry area near the water. This will show you if your pet can still remember and follow all of the learned instructions even when not at home. Step 9: Once they are comfortable near the water, bring the board into the shallows and straddle the board with your dog in their proper position. By introducing them to the water with you paddling from a sitting position, the board won’t rock as much and they can slowly become accustomed to the feeling. Take it slow and ensure that they are comfortable at all times. If your animal shows signs of being distressed or acts like they want to jump into the water but they are afraid, it may be time to turn back and go for another short excursion another day. Some dogs will take to the adventure quite well and be ready to go in no time. Others may need more training so that both you and they feel more confident when standing on the board when in the water. Always be sure to keep an eye on what your dog is doing – are they panting heavily, are they trying to lay down, are they trying to turn around on the board, are they looking at the shore and acting as if they are trying to figure a way to get there – their body language will clue you in as to when it’s time to call it a day and come back another time for a bit more experience a little at a time. Have a look at this video for a similar approach. As mentioned, safety is of the utmost importance and there are some precautions that should be taken to ensure the safety of both you and your canine family member. Let’s look at some of them now. Just as with any human who will be out on the water, a canine should be wearing a PFD (personal floatation device). The PFDs made for dogs are usually worn like a vest. Your pet should be comfortable in the device, but it should be the proper size for their body size as well as weight. Make sure that you can adjust the PFD with straps and buckles so that you can fit it to them snugly. There is no point in having them wear a floatation vest if they will be able to slide out of it when they need it most. 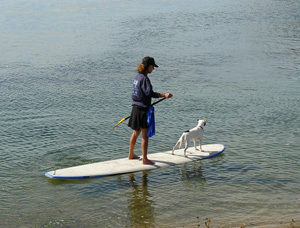 Some SUP boarders use a leash or tether to attach their dog’s PFD to their board. While this can keep them from wandering off too far and may be a deterrent for some dogs to jump into the water, it’s much better to train them to follow commands to stay on the board or to jump off, or even to get back on. If the dog is leashed to the board and does decide to jump into the water, they may pull that leash and topple you into the water as well. The leashes can be dangerous for your dog as well as if they end up in the water accidentally, they can get caught up in the leash. This can make it difficult for them to continue swimming or can cause them to become disoriented which can lead to injury. Dogs that have sensitive skin, short hair, or light colored hair will need a pet-approved sunscreen lotion so that they don’t burn. If you need help choosing one that would be right for your pet and the activities you will be taking them on, it’s a good idea to ask your veterinarian for recommendations. Even dogs that don’t have the above-mentioned issues should have sunscreen lotion applied to their ears and their muzzle. Most dogs have bare bellies, or at least a lot less hair on them. The sun’s rays can reflect off of the surrounding water and burn their bellies so applying sunscreen here is a good idea as well. For safety reasons, your dog should be comfortable in and around water before any training on a SUP board takes place and especially before your dog and the board are brought to the water. If your pet is afraid of water and you try to train them to ride your board with you too soon, they may never want to go near the water or your board again. The water training should be done prior to any introduction of the board. While paddleboarding – as well as bringing your pet along with you on that paddleboard – is a fairly new concept to the world of outdoor water sports, enough people have done this so that their tips when doing it yourself can be shared. Let’s look at some tips. 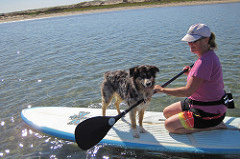 Many dog owners who bring their pets with them on paddleboard adventures have noticed that the inflatable SUP boards are easier for the dogs to stand on rather than the hard plastic of the traditional ones. Some inflatable paddleboards are not rated with high enough weight limits to have both you and a dog (if your dog is of decent size) on it and still paddle efficiently so it’s important to look at the specs for each board you are considering. Also, there are several inflatable SUPs that are made to bring a pooch along so the PVC material is thicker and there are added traction grips in the front for them. Research is key. 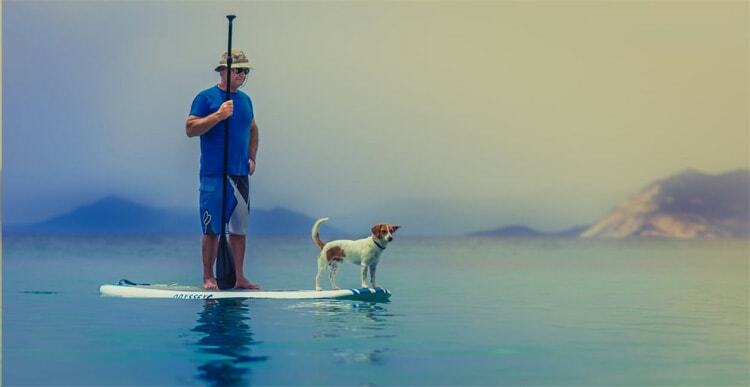 Whether you choose to go with an inflatable SUP or a traditional paddleboard, you need to make sure that the board is long enough to allow for you to sit or stand comfortably in the proper spot on the board to maintain balance, and still give your dog enough room to stand at the front. No one should be crowded. A thicker and wider board will also help with stability which can make your dog more comfortable on the water, especially when first starting out. Once again, the PFD (personal floatation device) that you fit your dog into must be the proper one for them. If it doesn’t fit the way it is meant to, they can slip out of it if they were to accidentally end up in the water and they could get hurt. Also, if the PFD doesn’t fit properly, if they are floating in the water, the vest can slide up and rub their belly, their underarms, or the underside of their neck. If they are uncomfortable wearing the PFD, they will associate that feeling with the paddleboard and the activity and want to avoid it. So, to avoid injury, causing discomfort, and to prevent an aversion to paddleboarding, it’s important to properly fit the PFD to your dog. The biggest rule of all both when introducing your dog to paddleboarding and when they are seasoned pros and enjoy it just as much as you do, is to always make sure their experiences with the paddleboarding equipment, the water, the trip to the paddling spot, and participating in the sport, is all positive. If something does happen, such as you and your dog spilling into the water for some reason or another, be sure to follow it up with something positive like a treat or snuggles as you both get dried off and ready to either go again or head home for the day. Paddleboarding with your dog can make a fun sport even more fun. There’s nothing quite like packing up your gear and your best friend into your car or truck and heading out to the lake for a day of sunshine and fresh air.